Spray 12-inch nonstick skillet with nonstick cooking spray. Heat over medium-high heat until hot. 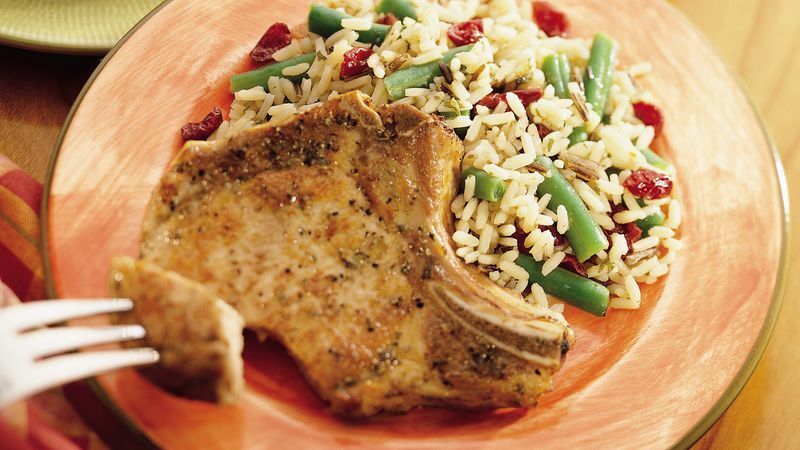 Sprinkle both sides of pork chops with marjoram and pepper. Place in skillet; brown on both sides. Remove pork chops from skillet; cover to keep warm. In same skillet, combine rice, seasoning packet from rice mix, water and apple juice; mix well. Bring to a boil. Reduce heat to low; cover and cook 25 minutes. Stir in cranberries and green beans. Return to a boil. Place pork chops over mixture. Cover; cook over medium heat for 4 to 6 minutes or until pork is no longer pink and rice and beans are tender.